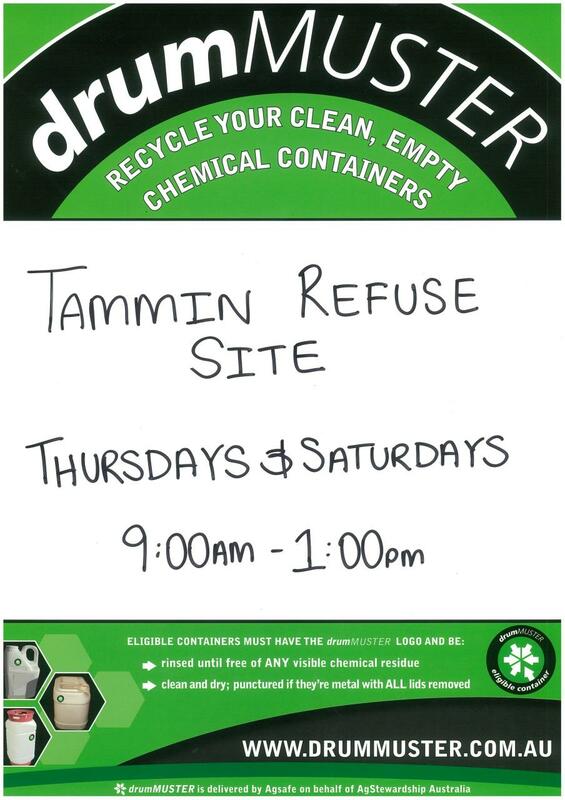 The refuse site is open on Thursday & Saturday from 9am to 1pm to Tammin residents ONLY! glass bottles & jars (no lids please). The rubbish removal service is provided under contract by Avon Waste. Rubbish is collected on Friday each week. Do not leave your bin permanently by the kerb as the replacement of a stolen or damaged bin may be at your expense. The bin has a serial number stamped on the side, and this number is recorded against your property address. Should you vacate the house, the bin should remain. A new bin will be provided at your new address within the area serviced by Avon Waste. Further details may be obtained by clicking on the following link: http://www.avonwaste.com.au/shires/tammin.aspx. Any problems with the service or changes to the service, please contact the Shire Office.